Karolina Kruszyńska, a Google spam fighter who focused on Polish spam and was the face between Polish webmasters and Google, is leaving the Google webspam team and going into a completely different space. After fantastic two years I will be leaving the Polish Webmaster forum. I decided to take up a new challenge and will be continuing my adventure with Google in a new team in London. I would like to thank you all for this time and in particular our Top Contibutors and Rising Stars :) You all rock! The new Googler who will be taking care of the forum will be Michał - many thanks in advance for giving him a warm welcome to our community! Also using this opportunity I would like to wish you all Happy Holidays and Happy 2015 :) ! Michał Wiciński on Twitter at @MichalWicinski, is taking over her role. He has been with Google, according to his LinkedIn profile, for a year and three months. 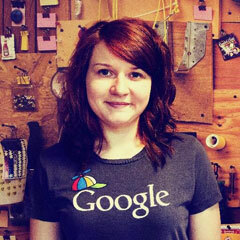 Karolina told me on Twitter she will be joining a startup within Google, a company Google acquired in January 2014. It is not spam or search related, so she will be out of the search and spam business for some time.